Esensi: Jurnal Bisnis dan Manajemen. The Journal published by Faculty of Economic and Business Syarif Hidayatullah State Islamic University of Jakarta. This journal focused on Accounting, Business, Economics, Finance and Management studies. The Journal is published twice a year. The aim of the journal is to disseminate the accounting, business, economics, finance, and management researches done by researchers both from Indonesian and overseas. Esensi has become a CrossRef Member since year 2015. Therefore, all articles published by Esensi will have unique DOI number. 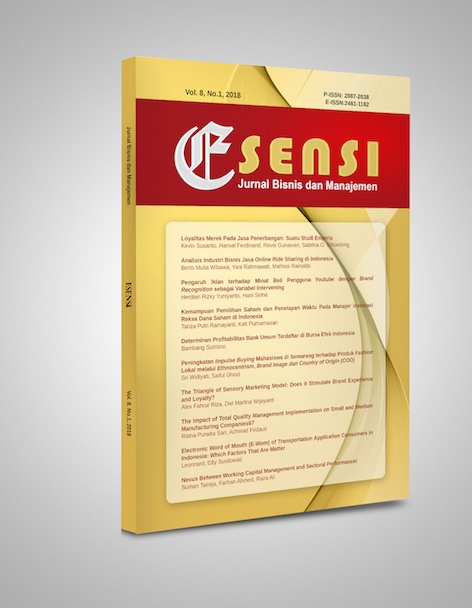 Esensi: Jurnal Bisnis dan Manajemen is indexed by Sinta (S3), Directory of Open Access Journal (DOAJ), CrossRef, Google Scholar, Portal Garuda, Moraref, Sinta, Indonesia One Search, ISJD LIPI, etc.